Rathfriland Rangers will be looking to bounce back to winning ways against Warrenpoint tonight (Tuesday). 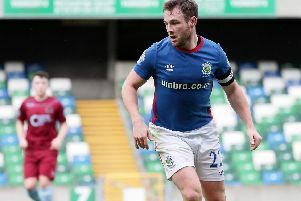 Near neighbours Warrenpoint will be the visitors to Iveagh Park (kick-off 7.30pm) as the Gers seek out a victory after losing 3-2 to a Crusaders XI on Saturday. Point agonizingly dropped into the lower tier of Irish League football last season after that fateful May Day when a last minute turnaround at Milltown sealed their fate. Nevertheless the Point have held on to most of their players and added former Rathfriland Rangers goalkeeper Shane Harrison to their ranks which adds a little extra spice to this pre season clash. It’s an interesting match in prospect with Rangers Manager Paul Kirk also recently adding to his squad with the acquisition of former Lisburn Distillery player Nathan McConnell. On Saturday, Rangers narrowly lost out 3-2 to a bright, young Crusaders side in front of a big crowd at Iveagh Park. New boss Paul Kirk took charge of the Whites for the first time, and his side went ahead through Darren McGrath in the second-half. But Benji Hendron levelled immediately before McGrath restored Rathfriland’s lead, although slack defending allowed the Crues to take the win, with Jack Smith and Brandon Doyle netting the goals. In spite of the defeat, Rathfriland generally had reason to be happy with a high-tempo display in only their second game of the pre-season campaign. New signings Mark Winstone, Johnny Roy, Daryl Evans, David Graham, Jack Graham and Nathan McConnell all started for the Whites, who had the better of the attacking play in the opening exchanges. And Winstone was called into action on 18 minutes, acrobatically stopping Hendron’s header from Dale McCreery’s whipped cross. Chances were otherwise at a premium in the first period, but that changed after the break. McGrath opened the scoring just before the hour mark when he swivelled on the left side of the box and curled a magnificent effort into the far top corner. But the lead was short-lived, as moments later a long ball upfield from the Crues defence sailed over the Rathfriland backline, with Hendron latching on and lobbing the ball over substitute ‘keeper Shane Harrison. But less than 10 minutes later, McGrath added his second of the day, when a corner was laid to him on the edge of the box and he fired into the corner. Kirk rung the changes with several substitutes to freshen his midfield and defence after good shifts from his starters. But some sloppy play at the back allowed the Crues to level again. The Whites failed to clear the ball from their box on 84 minutes and Smith was lurking on the edge of the area to rifle the ball low beyond Harrison. And just as the game seemed to be petering out to a draw, Brandon Doyle tore through the Rathfriland midfield and defence with a great run and finish in stoppage time to win it for the Belfast club. The crowd had been treated to a pulsating second-half, and while the defeat will be something of a disappointment Kirk’s side certainly showed plenty of promise. Rathfriland Rangers: Mark Winstone, Johnny Roy, Conor Larkin, Daryl Evans, Jonny Black, Darren McGrath, David Graham, Jonathan Scannell, Jack Graham, Nathan McConnell, James Costello. Subs: Shane Harrison, Chris Havern, Daniel Hawe, Andrew Stewart, Ally Wilson. Abbey Villa v Rathfriland 30th July- ko tbc.